How does a town of 1,700 have such staggering and unparalleled success? Sign up for RinkRat 19 Hockey School today! Other fun facts – I enjoy playing the piano, track, math, and swimming. I have participated in the state piano competition, state Math Counts competition, and the 2012 state class A track meet where I placed 8th in the 1600 meter run. I have been to the RinkRat 19 camp for 3 years and I really enjoy it. It’s fun coming back and seeing friends from past years at camp and making new ones. 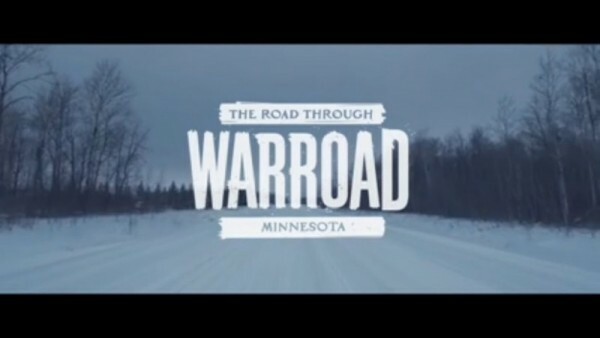 I love coming to Warroad every summer and having a whole week set aside just for playing hockey. The coaches work us hard and make camp fun. I’ve learned lots at Rink Rat 19 and I can’t wait to learn more. This was my first year playing on the varsity team for Crookston. We were a young team with several 8th graders playing on the team and it was a building year for us. I’m looking forward to next year when we all will have a little more experience under our belts. Trechelle Bunn is recognized as the camper of the month for May 2012. Trechelle (and her huge smile) has been a constant at RinkRat 19 Hockey School. A fun fact: she lives in Canada but cheers for Team USA…thanks for following our team and cheering us on!!! Trechelle is such a kind, cheerful kid to be around and has improved tremendously every summer. Last year she took home the RinkRat 19 award for embodying the meaning of “rinkrat.” Enjoy getting to know the May 2012 RinkRat 19 camper of the month! In the London Olympics I look forward to watching Usian Bolt because I run the 100m and 200m and never lost a track meet!!!! I was born in Roseau Minnesota but live in Wampum, Manitoba, Canada, and go to school in Sprague, Manitoba, Canada!!! My dream is to play in the Olympics one day for Team USA like Gigi!! In the Summer I enjoy doing the Lamplighter fill the net challenge, Swimming and doing Triathlons!! For the Stanley Cup I am going for the New Jersey Devils! 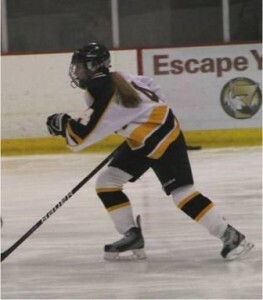 This year I played my first year of 12U with Warroad 12U. One of my favorite camp memories was getting the RinkRat award and believe it or not doing stairs!!! My hockey number this year was #3 but usually I prefer #33 because of Byfuglien and because I was born on March 3rd! I’ve been skating since I was 2 years old and I started playing hockey when I was 6 Years old so I’ve been playing hockey for 6 Years!! And this year I played In the Manitoba Indigenous Games!! I also played spring Hockey this year with the Sioux Valley Dakotas! This addition of the RinkRat 19 blog is brought to you from Lake Placid, NY. Team USA is training here in preparation for the 2012 World Championships in Burlington, VT. Our first game of the tournament is April 8 against Canada. Anne Schleper (another RinkRat 19 coach) is also on the team and you can follow us at usahockey.com. To get you warmed up for rooting us on at Worlds, send out a cheer to Haley Ravndalen: April’s RinkRat 19 Camper of the Month. As you read Haley’s comments, you’ll notice that she never once mentions her ability, skill, or accomplishments. “Let another praise you, and not your own lips” is a quote that many try to live out and here’s a young kid who already embodies this statement. 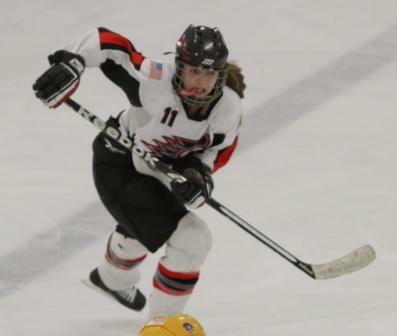 Let me step in then and praise her: great skater; constantly improving her skills; hard worker; huge potential; annually up for Most Coachable award; makes fast friends with fellow campers; kind, caring, honest; and a solid fisherman (no worms are allowed on the boat this year). Congrats Haley! This season was pretty good at Lakeville South High School. Playing both Varsity and JV–it was a fun and hardworking season. We also got our new head coach Natalie Darwitz which was a great experience. Our team this year made it to the section finals. Overall, the journey of our season was amazing. RinkRat 19 has always been one of my favorite camps to go to. Its so much fun and I have made many new friends there too! I have always looked up to Gigi as a person and hockey player, so it is so much fun to take a road trip up to Warroad and spend time with her and the other coaches. I have made many memories there that I will never forget! The month of March is upon us! You know what that means…it’s almost my birthday and yes presents are encouraged! But seriously, the 1st of March means that a new RinkRat 19 camper must be featured. 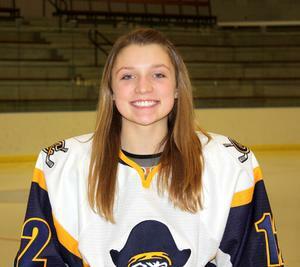 Today’s column is dedicated to a Hockeytown, USA, kid by the name of Sara Baumann. Fav Player: Gigi Marvin, because she played for Warroad High School, was Ms. Hockey, and was a 2010 Olympic Silver Medalist. Also Karley Sylvester, because she played for Warroad High School and was Ms. Hockey in 2011. This season our 14UA record is 15 wins and 18 losses. We only have 11 players this year (10 skaters and 1 goalie), but we have been playing hard all year. Our next games are in the regional tournament on March 2nd, 3rd, and 4th, so hopefully we can do good in that. I love hockey (even the 6:30 morning practices), so it is fun living in Warroad (Hockey Town U.S.A.) and being on the ice a lot of the time. It is so much fun playing in games and getting up early in the morning and heading out to play a couple games on the road or a tournament. Our high school girls have made it down to the state tournament for the past 4 years, so it is fun to go and cheer on them, too. The Rink Rat 19 camps have been a very fun experience, and have helped me become a better player, with the on ice drills and skating, and the dry land drills. It is fun to go there each year and learn something every day. It is also very cool getting advice from and being in a camp with Gigi Marvin. I am excited to go again this summer! 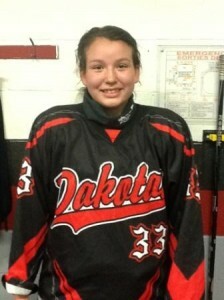 I’m excited to announce that Cheyenne Harris is the first person to be recognized in the RinkRat 19 Camper Feature! Each month, one past RinkRat 19 camper will be highlighted. 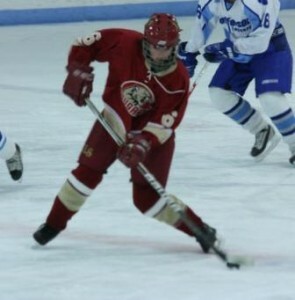 Favorite athlete: Kyle Rau (: So Hot! and Gigi Marvin of course. Favorite camp memory- I have a lot of favorite memories. My favorite thing to do on the ice is summer salt relay-races (: I think the first time I went to the camp was one of my favorite memory because I was so excited to go and skate with Gigi Marvin, and I was also a little scared that it was going to be a super super hard camp, but it wasn’t at all! It is hard work and conditioning mixed in with a lot of fun. The first time we did dizzy cones was a sight to see. Or the first time we did backwards jumps. (: I honestly can’t pick out one favorite memory, but one that has impacted my life to this day is when my dad and I met Gigi. We both have become so close to her and I am grateful as she has helped me so much throughout the years. She has had a big impact on me and the way I learn and play the game. Motivating me and showing me the determination it takes to get better and better every year. Gigi has so much experience and she is always willing to share with players like me. She tries so hard to make hockey a better and closer community and she does a great job! I am lucky to have had the opportunity to meet her, skate with her, and become great friends. As far as how this season is going, I would say we are doing well. We are ranked 8th in the state and are coming close to the district tournament, then regions and hopefully, if we make it through, on to state. Our team is finally starting to play together and work for each other. We won the cake eater tournament this year which is the first time a Centennial girls team has ever done that, I am very proud of our team for that one. Our daughter had a great time at your hockey camp. How can we sign up for next year's?